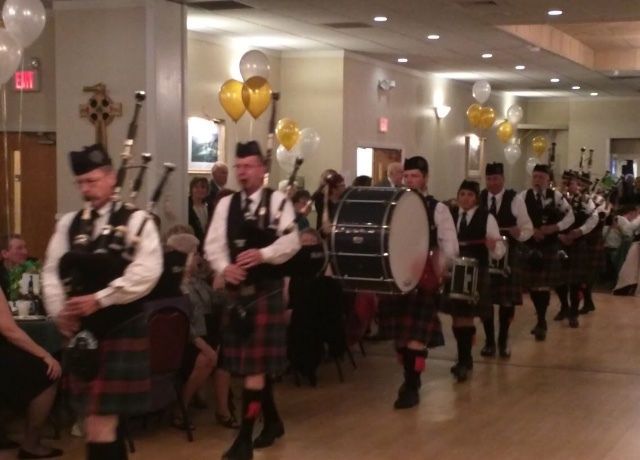 On March 17th, the Hibernian Hall in Babylon hosted their annual Saint Patrick’s Day Party. There they had music, traditional Irish food, and various performers, such as an Irish marching band and irish step dancers! Much of the crowd was Irish families, and most of them were members of the Hibernian Hall. Although I’m not a member, I still went and had a great time, which shows that anyone can go and have fun! For the music, they played both pop songs that you’d hear on the radio and Irish music. Since there was a dance floor, there were also always people dancing, and at one point Irish Step dancers performed! The step dancers were from Mise Erie’s Irish Dancers, and they danced both hard shoe and soft shoe, the two different styles of Irish Step dancing. After the dancers left, a traditional Irish marching band performed in the Hall! There were drummers and bagpipers, and much more! Another aspect of the night was the food. Since it was Saint Patrick’s Day, they only served traditional Irish cooking, such as corned beef and cabbage, potatoes, and Irish stew. As reported from those who were there, it was very good and tasted great! In conclusion, if you would like something fun to do next Saint Patrick’s Day, I’d definitely suggest going to the Hibernian Hall in Babylon for an exciting night!